I think of September as Enrico Fermi’s month. His birthday is 9/29/1901. It’s a little early to sing, but I thought I’d introduce my own favorite aspect of Fermi’s contribution to science—his problem solving technique. 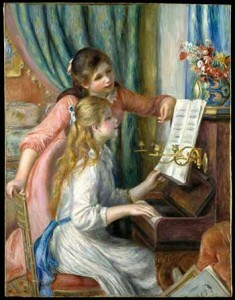 Renoir's "Two Young Girls at the Piano"
This is the legendary problem presented to his classes by the Nobel Prize winning Italian-American physicist. It’s the original of a category of problems called “Fermi problems,” meant to be solved by putting together reasonable estimates for each step of the solution. At first glance, Fermi problems seem to be impossible to solve without research. The technique is to break them down into manageable parts, and answer each part with logic and common sense, rather than reference books or, these days, the Internet. By doing this systematically, we arrive at an answer that comes remarkably close to the exact answer. By the end of this calculation, we also see what advantages it has over looking up the answer on Google. 1) Assume that Chicago doesn’t have more piano tuners than it can keep busy tuning pianos. 2) Estimate the total population of Chicago. At that time, there were about 3,000,000 people in Chicago. 3) Estimate how many families that population represents. The average family consisted of four members, so the number of families was approximately 750,000. 4) Assume that about one third of all families owns a piano. That gives us 250,000 pianos in Chicago. 5) Assume that each piano should be tuned about every 10 years. That gives us about 25,000 tunings per year in the city. 6) Assume that each piano tuner can service four pianos per day, and works about 250 days a year. Each piano tuner would perform 1,000 tunings per year. Summary: In any given year, pianos in Chicago need 25,000 tunings; each tuner can do 1,000 tunings, therefore we need 25 piano tuners. The answer was within a few of being the number in the yellow pages of the time. Why not just count the listings in the yellow pages in the first place? A good idea, until we remember that “solving a problem” is an exciting, challenging word to people like Fermi and to scientists in general. Difficult problems are even better opportunities to test their minds and their ability to calculate. Another of Fermi’s motivations in giving this problem was to illustrate properties of statistics and the law of probabilities. He used the lesson to teach something about errors made in estimating, and how they tend to cancel each other out. If you assumed that pianos are tuned every five years, for example, you might also have assumed that every sixth family owns a piano instead of every third. Your errors would then balance and cancel each other out. It’s statistically improbable that all your errors would be in the same direction (either all overestimates or all underestimates), so the final results will always lean towards the right number. Fermi, present at the time, was able to get a preliminary estimate of the amount of energy released by the atomic bomb—he sprinkled small pieces of paper in the air and observed what happened when the shock wave reached them. 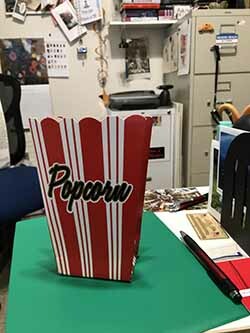 A container of pop corn in my office? It's for purely experimental purposes. • how much popcorn would it take to fill your family room? • how many pencils would you use up if you drew a line around the earth at the equator? For Fermi, there was great reward in independent discoveries and inventions. Many contemporary scientists and engineers respond the same way. Looking up an answer or letting someone else find it impoverishes them, robbing them of a creative experience that boosts self-confidence and enhances their mental life. Could this also be why they don’t ask for directions when they’re lost?